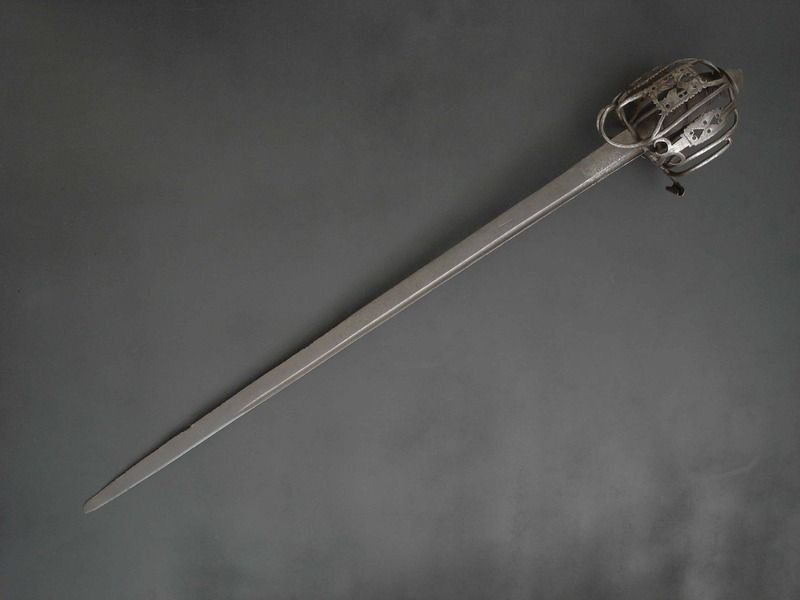 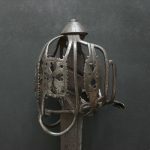 An attractive and functional late 17th century brass hilted English Officers sword mounted with a fine quality German blade. 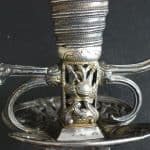 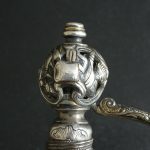 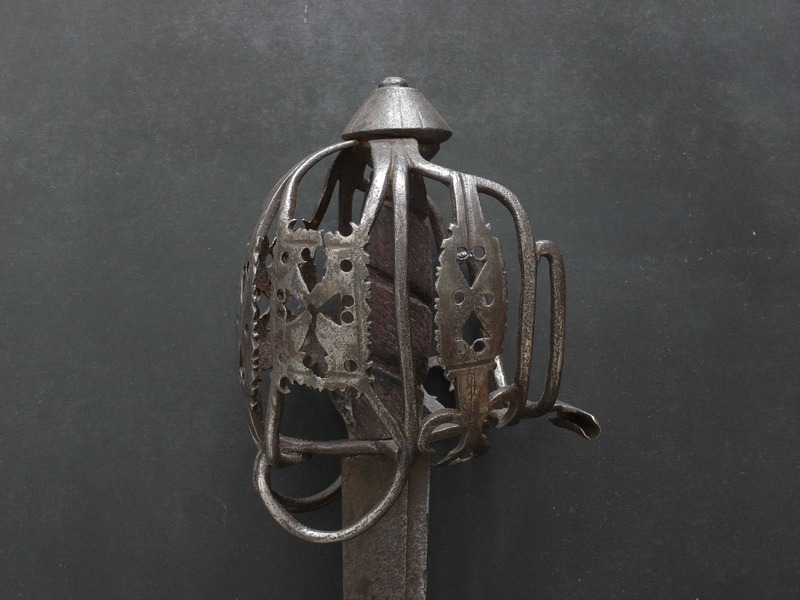 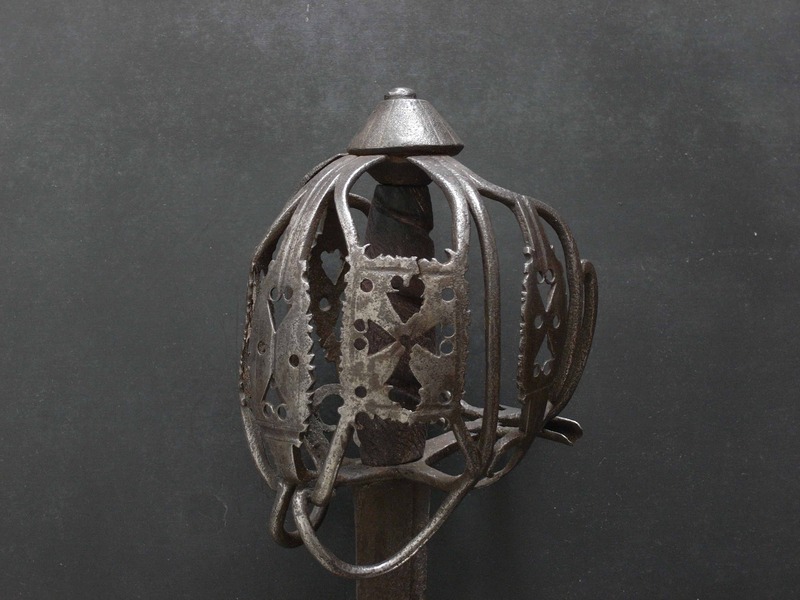 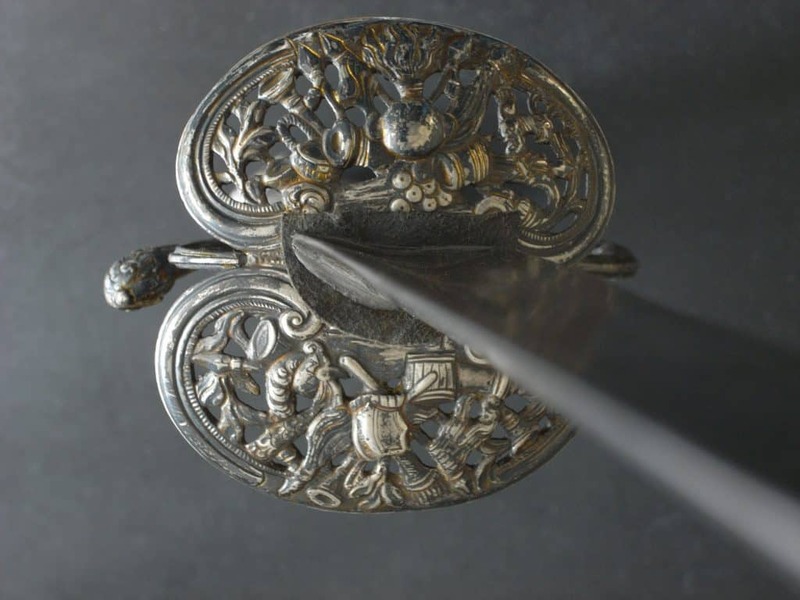 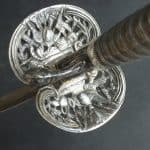 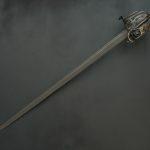 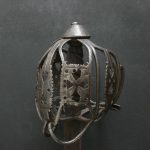 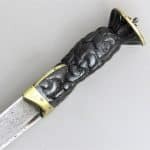 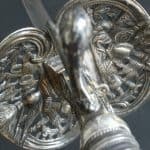 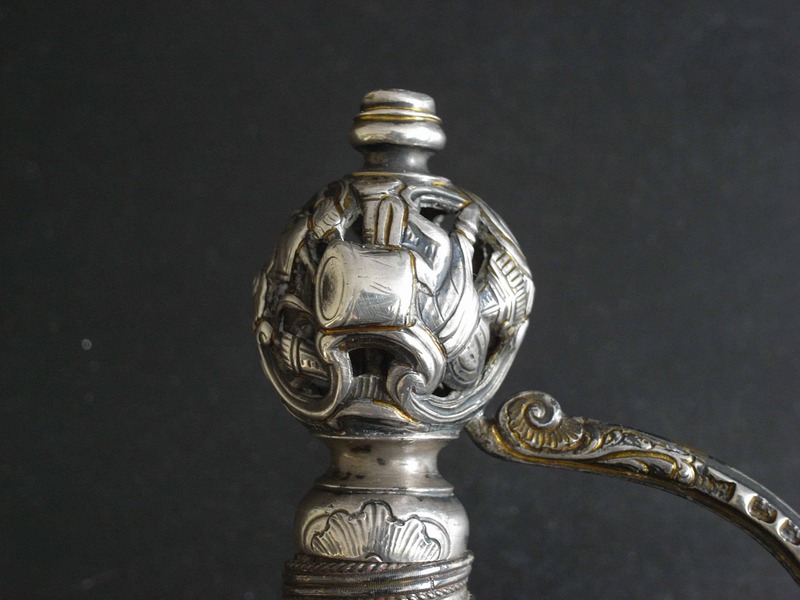 The hilt is formed with two moulded shell guards infilled with shallow brass plates with attractive foliate rosettes centred on the tang aperture on both upper and lower surfaces. 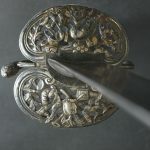 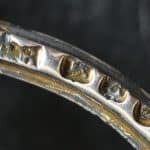 The shell guards have moulded fluted borders similar in style to the fluted designs on the knuckle bow, pommel base, ricasso, pas d’ane rings and rear quillon. 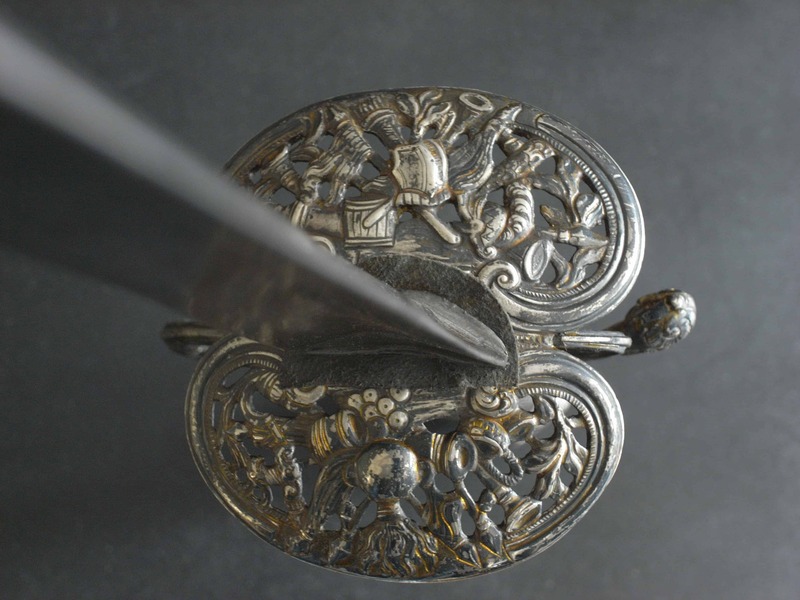 The pommel is of hollow construction into which the top of the knucklebow fits into a small aperture. 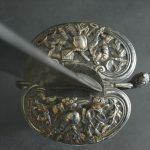 The top is decorated with a rosette centered on the integral tang button similar in style to the rosettes in the shell guard. 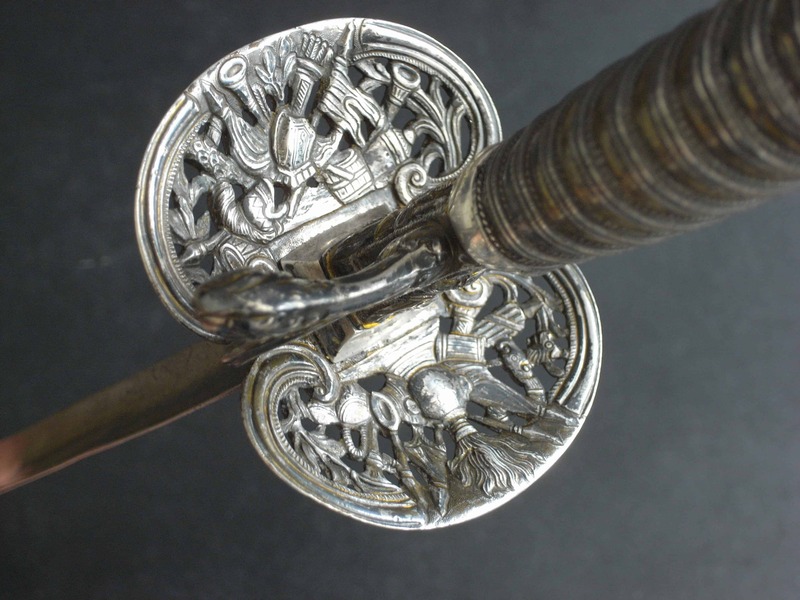 The grip is of wood with brass “Turks Heads” top and bottom and brass wire binding. 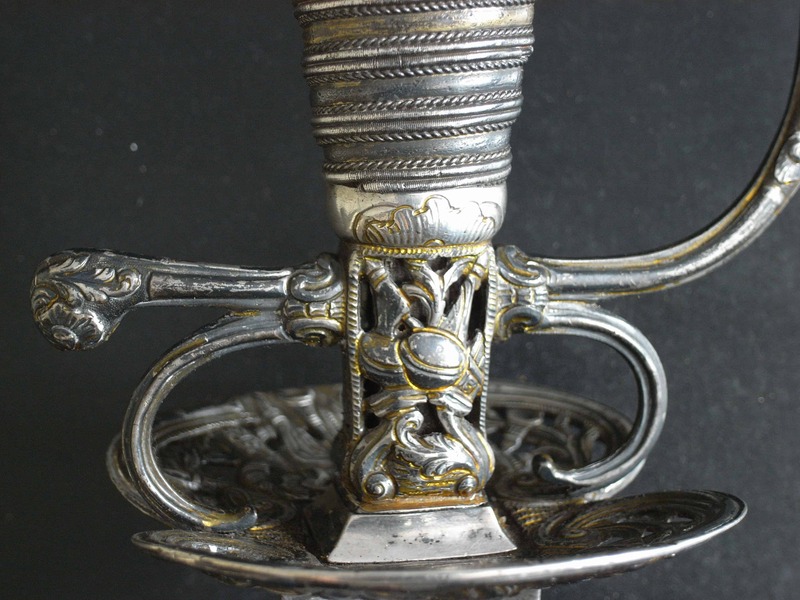 The thick, stiff, double edged lenticular section blade tapers to its point. 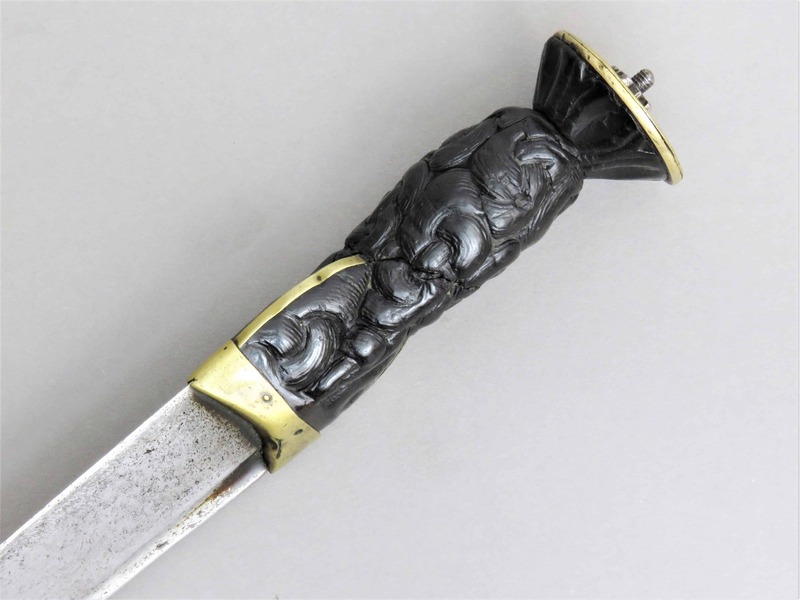 A single central fuller extends from the hilt for 6 inches (15 cm) either side inside which in bold letters on both sides “IN SOLINGEN” is present, the words separated and flanked by quatrefoils and dots. 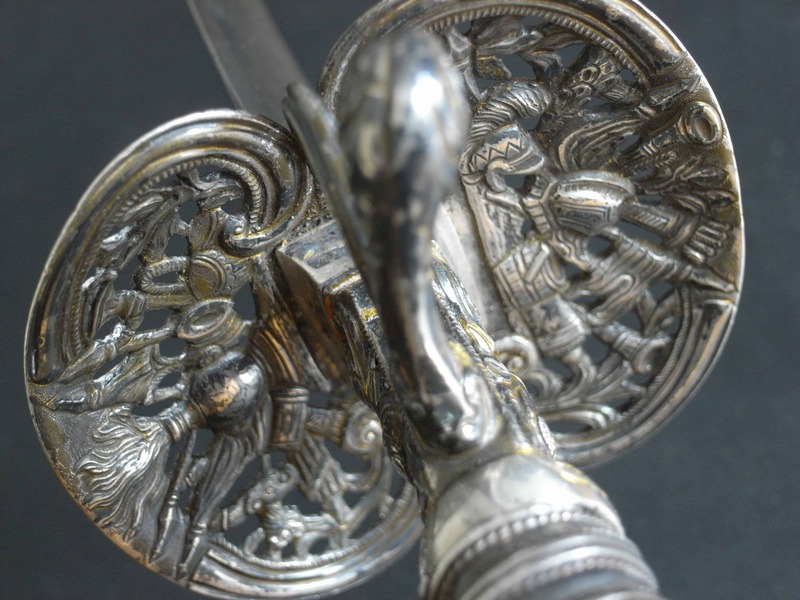 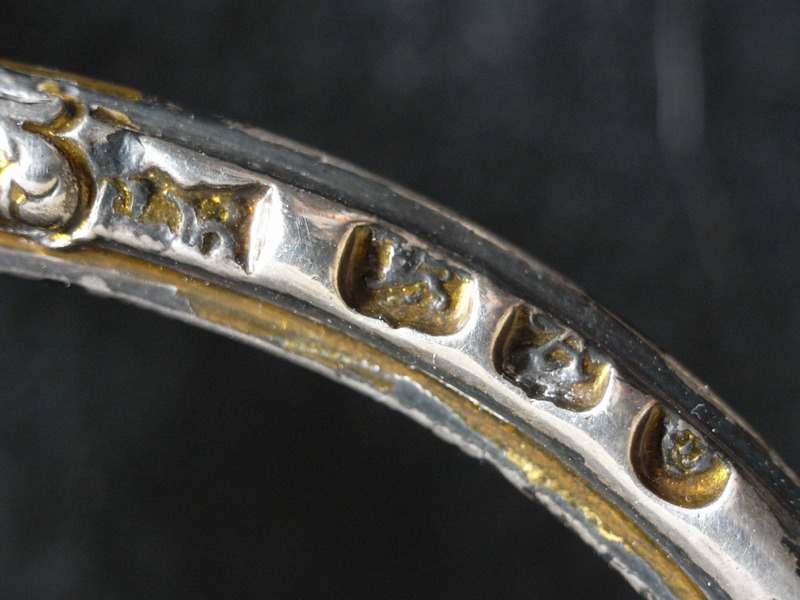 The sword is in good condition with a small dent to the pommel visible in the photographs below. 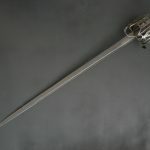 The overall length is just under 33.5 inches (85 cm). 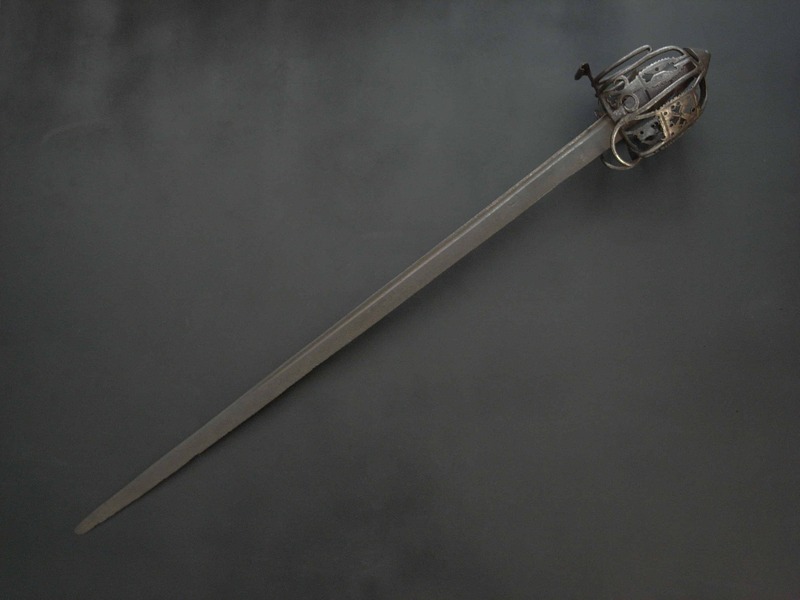 Blade length 40.5 inches (103 cm).